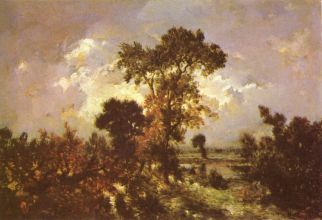 Pierre Étienne Théodore Rousseau (April 15, 1812 - December 22, 1867), French painter of the Barbizon school, was born in Paris, of a bourgeois family which included one or two artists. At first he received a business training, but soon displayed aptitude for painting. 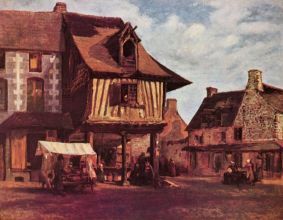 Although his father regretted the decision at first, he became reconciled to his son leaving business, and throughout the artist's career (for he survived his son) was a sympathizer with him in all his conflicts with the Paris Salon authorities. 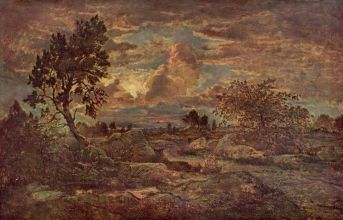 Théodore Rousseau shared the difficulties of the romantic painters of 1830 in securing for their pictures a place in the annual Paris exhibition. 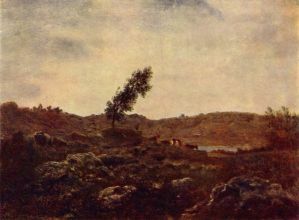 The whole influence of the classically trained artists was against them, and not until 1848 was Rousseau adequately presented to the public. 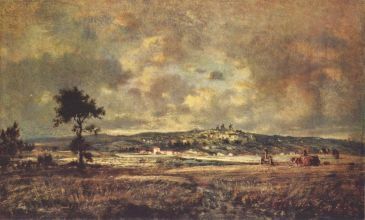 He had exhibited one or two unimportant works in the Salon of 1831 and 1834, but in 1836 his great work "La descente des vaches" was rejected by the vote of the classic painters; and from then until after the revolution of 1848 he was persistently refused. He was not without champions in the press, and under the title of "le grand refusé" he became known through the writings of Thor, the critic who afterwards resided in England and wrote under the name of Burger. 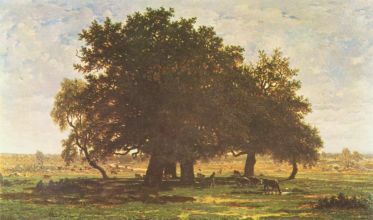 During these years of artistic exile Rousseau produced some of his finest pictures: "The Chestnut Avenue", "The Marsh in the Landes" (now in the Louvre), "Hoar-Frost" (now in America); and in 1851, after the reorganization of the Salon in 1848, he exhibited his masterpiece, "The Edge of the Forest" (also in the Louvre), a picture similar in treatment to, but slightly varied in subject from, the composition called "A Glade in the Forest of Fontainebleau", in the Wallace Collection at Hertford House, London.